Fresh roasted Hatch green chiles, still warm from the fire. Steve brought home two more bags of fresh roasted green chiles, still warm. Hot and spicy Hatch chiles are my favorite. The fragrance is smoky, sweet and spicy all at once. I wish Blogger provided smell-a-vision. 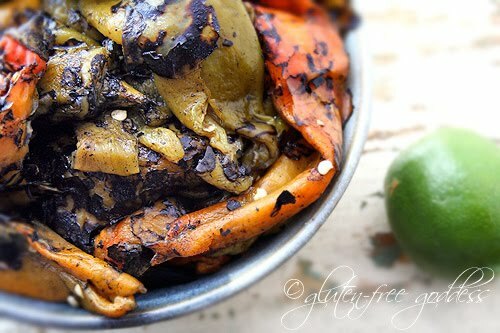 I got cookin' and whipped up a vegetarian version of my New Mexico green chile. Green chile is versatile. A sauce for your enchiladas. A stew. A base for chili. You can use it in casseroles (pictured is my Green Chile Tortilla Bake). Choose fiery hot or mild chiles, to taste. In a large saucepan, combine the chiles, garlic, tomatoes, broth, sea salt and pepper, vinegar and sugar. Bring to a simmer over medium-high heat; reduce the heat a bit and maintain a gentle, constant low simmer for ten minutes. Stir in the cornstarch paste and continue to cook, stirring for another 7 to 10 minutes, until the sauce is thickened [but still pourable]. Taste test. If you used very hot chiles and the sauce is too spicy, add a touch more sugar. Remove from heat and set aside. Use this green chile as a sauce on enchiladas and casseroles, or pour it over eggs and tortillas, or rice and beans - you name it. I can't imagine anything that wouldn't cozy up to green chile. Well, chocolate chip cookies, maybe not so much. Yummy. I love these. Wish I had some right now. Thats two of us, that would like the mailman to deliver to us a bag of warm chillies! Yes, there are so many wonderful things to do with it. I would also scoop it up with freshly cooked tortilla chips--heaven! I have just been introduced to these little delights!! I didn't get enough last year at Whole Foods here in Houston so I have REALLY stocked up this year!! I might even have enough to venture out to the Green Chili sauce!! It sounds divine!! I freeze them on a cookie sheet and then transfer to a baggie. Won't even look at those nasty canned things at the grocery store now! Not the same thing AT All is it?? I have plant with more chillies on it than I know what to do with! Ooh now I know what I'm gonna do with all my extra chillies! Thank you! Karina, you are punishing me! I mentioned before how i love roasted green chillies... but since your post i have not found the right chillies to grill. I can see they look so fresh. Bring on the heat, i love them hot too. I made the sauce and it is delicious! I had to make an alteration where the chillis were concerned but I don't think it matters, it was divine anyway! STOP! It's lunchtime and my stomach is going crazy thinking of all the yummy things I could make with this sauce. Wow! I just made up a batch, BEST VEGGIE GREEN CHILI EVER! Im not joking. Thanks for sharing.